In this Valla Build Guide, we provide an overview of her strengths, abilities, talents and matchups. Valla is a ranged assassin that's capable of not only dealing huge amounts of damage but also comfortably farming lanes. She doesn't have a huge amount of survivability but if she pairs with a support or warrior, she can be incredibly powerful thanks to a mixture of slows and high burst skills. She remains one of Heroes of the Storm's most popular characters and it's not surprising: if she's left on the back line to fire away, she really will carry a team. Just be conscious of the fact that despite her being somewhat mobile, she can be focused easily, especially if the enemy team has Jaina, The Butcher or one of a few other Heroes who are good at countering her. You should also be aware that despite being a ranged assassin, like most others her range isn't huge until late game and as such, she needs to position herself well to not only ensure she can deal damage but escape when needed. Hatred (Trait) – If you’ve ever wondered why Valla seems to win so many trades in lane, this is your answer. Each stack of Hatred up to a maximum of 10 gives a 8% damage and a 1% movement speed bonus. When playing her, it’s best to get off some attacks on minions before looking for a trade, to ensure that you have some of that bonus attack damage and speed. Of course, this will benefit you in team fights as well, both for damage output and having an easier time re-positioning. Be aware however that your stacks only last 6 seconds, so it's best to try to maintain them as much as possible. Hungering Arrow (Q) – The damage on this ability can be good, but beware of spamming it, as you’ll quickly find yourself out of mana. Given that it can hit a target multiple times, try to line it up so you’re either hitting a priority target with the arrow, or making sure the bounces will still be hitting enemy heroes, rather than just minions. It's sometimes to save this skill to finish players off with as it can often skim through multiple low health Heroes all at once. Finally, it's also worth noting that if against a single target and with no other enemies nearby for the Hungering Arrow to seek, all hits will attack that single target. Multishot (W) – There are several different ways to build Valla, where some will focus on Multishot as the main source of damage. There are multiple talents that will really help this ability shine, and on a relatively short cooldown, you become capable of putting out high AoE damage. Even early on, the damage is respectable, and combined with your passive, can make you difficult to lane against. At the very least it offers good lane clear and strong AOE team pressure. Vault (E) – As with any dash on a squishy Hero, you’re usually going to want to save this to re-position defensively. Whether it’s getting away from Zeratul or dodging a skillshot, Vault is generally best used when it’s saving your life. Of course, when you know it’s safe to do so, you can also Vault forward to finish off a kill that’s about to get away. The damage component of Vault, whereby it boosts your basic attack by 6% for 2 seconds, per stack of Hatred, is significant. Strafe (R) – If you’re focusing on Area of Effect damage and feel confident with your positioning, Strafe is likely going to be your Heroic ability of choice. It can put out a fair bit of AoE, but can be cancelled, and can leave you in a bad spot if you’re not careful. Don’t mindlessly pursue the enemy back line, and make sure your team can back you up. One positive is that while you can’t use your other damaging abilities during Strafe’s channel, you can activate Vault, making it a bit easier to keep yourself safe. Rain of Vengeance (R)– Your choice of Heroic may very well come down to team compositions, and the map you’re playing on. For the most part however, Rain of Vengeance is a must. If there’s a lot of fighting in chokepoints, and/or your team is lacking in hard CC from other Heroes, is undoubtedly the way to go. In fact, I'd argue that right now it's vastly superior to Strafe. Providing a good amount of damage, plus the ability to briefly lock down several members of the other team, can be incredibly valuable in any team fight. The fact it has two charges you can use back to back makes it exceptional. 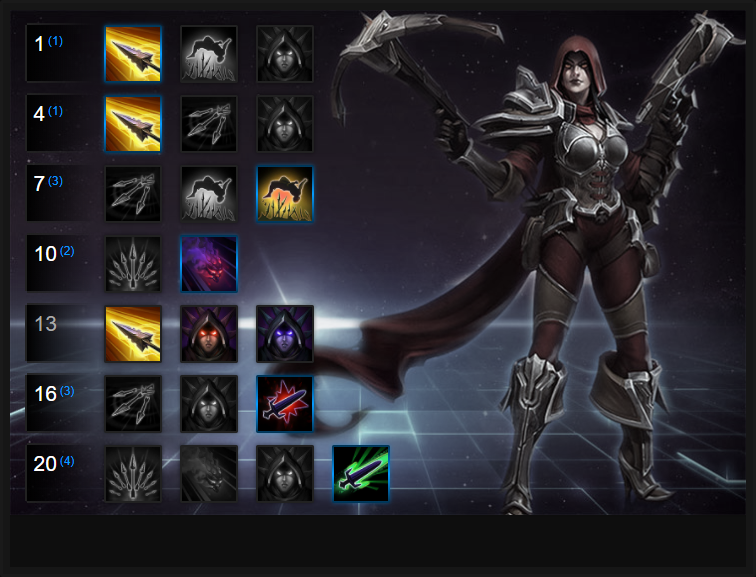 Like our Valla build guide? You can help support its updates by subscribing to Ten Ton Hammer. Here's the details. Allowing Hungering Arrow to deal 150% more damage to Minions and Mercs, Monster Hunter also lowers the cooldown of the ability by 40 mana, allowing you to cast it for as little as 20 mana. Puncturing Arrow lets Valla increase the damage of Hungering Arrow every time she lands it against an enemy Hero. The damage can be increased by 5, up to 100, and upon completion Valla gains a further 75 damage and 1 additional bounce. Repeating Arrow resets the cooldown of Hungering Arrow when you use Vault, allowing you to use the ability twice in succession. Against objectives such as The Immortal on Battlefield of Eternity, it ensures Valla can rip through it with ease. Rain of Vengence is an excellent ultimate ability but it does take significantly more skill to use than Strafe and there's a risk versus reward element because its range is short. The stun and damage is brilliant in any team fight and allows you to trap enemies in place. Providing Valla with immediate healing, based on 75% of the damage her Hungering Arrow deals, Siphoning Arrow can trigger twice thanks to her Hungering Arrow reset on Vault. Variable: Against an ability heavy composition Gloom is an excellent alternative. Providing Valla with a Spell Shield based on her Hatred stacks, Gloom can mitigate incoming damage by at least 20%. If you use it to consume Hatred, it can be boosted significantly higher. Causing every 3rd basic attack to deal 5% of an enemy Heroes maximum health, Manticore is effectively a new "Giant Killer" and offers an excellent spike every round of shots. A no-brainer, really. Farflight Quiver grants Valla a significant increase to her basic attack range, allowing her to acquire Hatred from safety while dealing significant damage, with little risk to herself. Variable: At 10 stacks of Hatred, Rancor will provide 20% additional attack speed, as well as a bonus 30% attack speed. If you can maintain the 10 stacks, certainly during a team fight, your arrows fly at lightning speed. These Hero Threat Levels (1 being lowest threat and 10 being highest threat) are to help you determine which enemy Heroes can give you a headache. Any Heroes that aren't on this list are easy pickings for Valla. If a Hero is listed here, take greater care. Azmodan: He has some skills that'll make life difficult if you fail to avoid them, but your burst rotation and his lack of speed should bring him down. Falstad: Can be a tricky matchup because Falstad has really great burst. If you get the drop on him first and use twin Hungering Arrows he should die easy. Jaina: A tricky Hero to fight due to her slows and snares. If she has taken Ice Block she can also survive your burst. Kael'Thas: His ranged threat combined with his ability to Gravity Lapse + DOT you make Kael'Thas incredibly annoying. Be wary around him. Nova: If she catches you from being cloaked, you're doomed. If she misses or you catch her out of stealth, she's gaurenteed to die. Sylvanus: She's undoubtedbly strong and in some respects, mirrors Valla. If you can hit her with two Hungering Arrow you'll usually come out on top but she is very annoying. This list of tips and tricks are just a handful of things we think will help your Valla play. We'll continue to add to the list as required and if you have any tips you'd like to share, let us know in the comments below and we'll place them here. 1. Always try to keep your Vault for escaping as opposed to doubling up on Hungering Arrow. You should only do that if you can gaurentee a kill and safe escape. 2. Your lane clear against minions is good thanks to Multishot. Try to do it as often as possible to push and soak. 3. You should always try to use Multishot when at maximum Hatred, followed by a Hungering Arrow, as it's a nice spike of damage. 4. Try to save your mana early game so you can stay in lane. Valla is mana heavy to begin with. 5. Although you're strong against most Heroes, you should still be pairing off with another Warrior for stronger pushes. 6. Remember that all your damage after using your two skills comes from Basic Attacks. Place yourself in positions where you can attack freely. 7. Try to always stay on the edges of a fight so that you can Vault away if a team fight isn't going your way. 8. Always try to focus squishy targets (Kael, Jaina, Tyrande) as you can quickly burst down their health and pressure them into retreating. 9. Only use Rain of Vegence if you know it will hit multiple targets. Its range is very short so be sure that your team is backing you up. 10. When talented try to only use Multishot at 10 stacks of Hatred to maximize its damage. The same goes for when in lane fighting minions. Thanks for reading our Valla build guide. You can help support its updates by subscribing to Ten Ton Hammer. Here's the details.